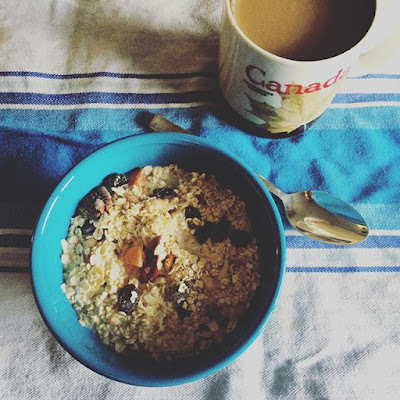 A nice big bowl of muesli and a cup of coffee? Good times, people. Today marks the start of National Breakfast Week. I was excited to write a post about this, and thought I’d share my current favourite meals, along with calorie and nutrient breakdowns for each. Growing up I adored starting the day with a healthy meal, from primary school porridge and toast through to boarding school cooked breakfasts, but like many people I got terrible at breakfasts when I hit uni and then the world of work. Too much coffee and sugar, or no breakfast at all, was all too often my go-to. In this year where I’m trying to overhaul my eating and exercise, to live a little more healthily, I’ve enjoyed sitting down and working out what I need from my breakfast, and ensuring I eat something which can keep me full. My portions of good, wholesome food can afford to be generous, but as I (hopefully) slim down I may have to shrink them a little too. Realistically though, I’ll still be aiming for 250-500 calories for breakfast….because I feel so much better when I do! I am losing weight (as I set out in my January goals post, update to follow at the end of the month), and I think good sturdy breakfasts are part of what’s helping me to do so. Here are some of my current favourites for the most important meal of the day. This is pretty much what I enjoy in an average week – I don’t profess to be any kind of expert but I really, really like food, and I hope what’s here might give you an idea or two. 366 calories. 47g carbs, 29g fat, 11g protein. This lifestyle change has given me a newfound respect for fats, and good, honest carbs. As my lunches tend to be quite light (soup, salad, stir fry, sandwich being the four go-tos), this is an ideal kick off to the day and means I never snack midmorning because I’m delightfully full. 303 calories, 43g carbs, 10g fat, 10g protein. I love making my own versions of muesli – it’s easy to skip out additions you don’t like, and to avoid extra added sugar. With so much sweetness from the dried fruit already, there’s no need for extra sweeteners here! My current combo is oats, almonds, pecans, apricots, raisins and cranberries. My usual serving is 3/4 cup of the mix with 100 mls semiskimmed milk, which comes in at a sensible total of around 300 cals per serving. 315 calories, 45g carbs, 4g fat, 25g protein. This is so simple. I layer greek yogurt, berries, and a little (1/4 cup) of my homemade muesli to make a tasty, calcium rich, start to the day. Greek yogurt is such a great source of protein; I used fat free because it’s what we had in on Wednesday! 283 calories, 58g carbs, 2g fat, 8g protein. Quick and easy! Microwaveable oats are a porridge gamechanger in this house. Topped with sliced banana and a 1/2 tbsp of honey, this is a great warming breakfast. 215 calories, 50g carbs, 1g fat, 4g protein. So quick and simple with the Vitamix! My current combination of choice is apple, carrot, spinach, with a splash of orange juice and some ice or water. So filling and a great way to get some goodness in early. One thing I’d love to improve in both this breakfast and the porridge one is the protein count, so I’m going to look into adding things such a whey protein to improve this. 268 calories, 24g carbs, 12g fat, 18g protein. Love this at the weekend. I always add a handful of cherry tomatoes or some spinach or peppers to my scramble to get a portion of veg in. A little sweet chilli sauce on top is sublime, and well worth the few extra calories. 454 calories, 43g carbs, 15g fat, 18g protein. Giant bap (I love Warburtons barm cakes! ), three slices of grilled bacon, healthy squirt of ketchup. So yum! So there you have it, some of my favourite breakfasts. All of these I’ll usually have with a coffee with milk (sometimes instant, sometimes filter). I don’t put butter on toast at breakfast time as I tend to have it with heavy things like avo or eggs – it’s surplus to requirements! With coffee these options clock in between about 250 and 480 cals, not bad at all, and a nice way to fill up ahead of the day. Now I’m curious – what are your favourite breakfasts? I’m always looking for inspiration. Tasty, tasty inspiration. Previous Post I Love Your Blog! Next Post Which wine wins?